This large room offers serenity among the clouds as you float with the angels into a blissful sleep on the king size bed with fluffy quilts. An abundance of blue tones and an angelic motif softly draped with chiffon creates an ethereal effect. A cushioned alcove crowned with an elegant antique hanging lamp completes the ambiance. The large private bathroom continues the angelic theme. A restored antique washstand and claw foot tub make this room truly unique. Soak in the claw foot tub or relax in the separate shower stall. One can just imagine the gold cherub floating over the tub serenading you as you soak away your cares. The king size bed in this room can be converted into twin beds upon request. 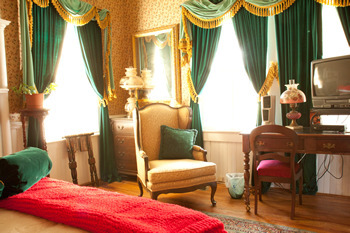 This room will transport you back in time to the days of luxury highlighted in "Gone With The Wind." Imagine Scarlett standing in front of the dresser gazing into the gold framed mirror surrounded by the infamous green velour drapes and the glamour of the long gold fringe on the valances. The backdrop for this room is a floral wallpaper reminiscent of another era. The original fireplace and ruby red glow of the antique chimney lamp will rekindle your romance as you sink into the feathered queen bed. The room is topped off by a collection of movie memorabilia, including a shadow box that highlights the important presence of Rhett, Scarlett, and Mamie. The warmth of this room carries into the private bath with the etched glass swing arm lamps. This room has a very large shower (no tub). It has also been designed for our guests with special needs. You will feel like royalty in this room. The comfy king bed and heirloom furnishings adorned with fringe and tassels will make you feel pampered and revered. The dramatic headboard in this room covers one whole wall and includes individual reading lights in the overhead valance. Relax in the whirlpool tub or shower in your private bath. Rooms can be reserved with a minimum 1 night stay. $25 cancellation fee. VISA and MC accepted. Ask about discounts.